Sales and shipments of servers are both approaching levels seen in the run-up ahead of the Great Recession in late 2007. This was thanks in large part to the voracious appetite for iron of hyperscale data center operators such as Amazon, Google, and Facebook, and despite cautious investments by enterprises outside of the cloudy app or hosting rackets. It took a while for the Great Recession to really kick in, affecting both server shipments and revenues independently in early 2008 and into 2010. At the time, there were plenty of big iron deals in the works as 2007 came to a close, and those deals have a lot of momentum and are hard to stop given the time it takes to get approval for a big-iron upgrade every three, four, or five years. You can, however, delay purchases of X86 clusters one, two, or as it turns out maybe six quarters in some cases. Because the server market is dominated by X86 rack servers, shipments fell and those mainframe and Unix box sales helped hold up revenues. The mainframe and Unix system cycles of new iron came in 2010, and the server market started to climb out of the revenue hole without a huge jump – but still a normal bump-up – in overall server shipments. 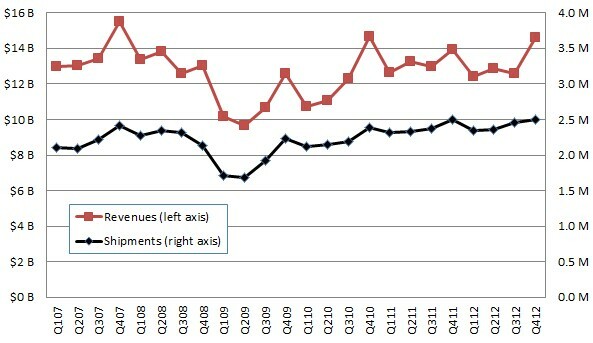 With revenues of $14.62bn in the fourth quarter of 2012, revenue levels are close to the peak set in the final quarter of 2007, six years ago. But based on past trends, you would have expected something on the order of 2.65 million boxes to go out the door, with sales of maybe $15.5bn. So that is 150,000 machines and about $1bn that didn't happen. With the server business so dependent on hyperscale data center operators, who buy in units of tens of thousands of machines these days, that could be just a handful of big deals for HP, Dell, and ODMs that are making machines for these hyperscale operators. It could also be tens of thousands of enterprises who would otherwise have bought new machines and decided not to. Gartner didn't point any fingers, and El Reg is just pointing out the pattern. For the full year, server shipments rose by 1.5 per cent to 9.67 million machines, but revenue fell by six-tenths of a per cent to $52.5m. Gartner server research vice president Jeffrey Hewitt definitely pointed some fingers for the annual numbers. "2012 was a year that definitely saw budgetary constraint which resulted in delays in x86-based server replacements in enterprise and mid-sized data centers," Hewitt said in a statement. "Application-as-a-business data centers* such as Baidu, Facebook and Google were the real drivers of significant volume growth for the year," he noted. "Relatively weak mainframe and RISC/Itanium Unix platform market performance kept overall revenue growth in check." In the final quarter of 2012, server revenues were helped substantially by IBM's System zEC12 mainframes, which launched last summer and started shipping in the fall. The people who make the most fun of the mainframe and want to kill it wish they had it, because the damned thing just won't die and leave Intel, Microsoft, and Red Hat with all the profits. The mainframe upgrade cycle helped boost IBM's overall server sales by 8.9 per cent to $5.1bn in the fourth quarter, giving Big Blue a little more than a one-third revenue share despite only shipping 291,328 boxes, according to Gartner. That was an 11.5 per cent decline in shipments for IBM. Big Blue has had some issues in its System x rack and tower and BladeCenter blade server businesses that the launch of the PureSystem family of modular, converged machines did not help last year. IBM's Unix server shipments were actually up a scant 1 point in the quarter to 22,863 machines, but Unix server sales fell by 19.2 per cent to $1.27bn. IBM did better than other Unix system suppliers – HP's Unix biz declined by 39.1 per cent to $341.8m and Oracle's was off 29.7 per cent to $341.4m – but this is a tough business. IBM and Oracle were in the process of upgrading their Unix systems in the fourth quarter, which didn't help matters. IBM actually pumped out a few Power7+ boxes and Oracle is expected to get Sparc T5 machines out the door in a month or so. HP's Unix business is suffering from an identity crisis after Oracle dropped an iceberg on the good ship Itanic two years ago, and now Intel and HP are pulling back on plans for a proper Itanium upgradewith the future "Kittson" Itaniums. The Unix systems business is not going away, any more than the mainframe biz has. But it is going away precisely to the degree that the mainframe did as hyperscale clouds and massively distributed applications are becoming preferred over fat apps running on big shared memory systems for a lot of workloads. Gartner reckons that the Unix server portion of the market fell by 25.9 per cent to $2.02bn in the fourth quarter. The Unix racket peaked in Q4 2000, with the former Sun Microsystems having the place IBM held; a year later, after the dot-com bust, Unix server sales fell 33 per cent to $1.74bn. For the full year, Unix system sales were off 19 per cent to $8.41bn. IBM raked in $4.9bn of that, Oracle $1.61bn, and HP 1.52bn, according to Gartner. The Unix server business generated more sales in 2012 than it did in 2001, and similarly had higher revenues in 2011 than in even 2000. It is helpful to remember that. Unix is a tough business, but it is not a bad one or a dead one by any means. But don't get confused. The x86 server is increasingly important in terms of the revenues it is generating, and has long-since dominated shipments. Which is why so many companies are trying to bring a new chip – the ARM collective, Tilera, and a few others – into the data center. The trouble is, Intel doesn't move as slow as IBM did with downshifting mainframes to compete, and Chipzilla moves a lot faster than the Unix vendors when reacting to changing market conditions. By the time ARM chips are in volume servers in 2014, Intel will have power-efficient Xeon and Atom chips out the door, blunting the attack. Intel cannot stop the attack, however, and it will come – as history shows it always does. In Q4 2012, vendors shipped some 2.46 million x86 servers, up only two-tenths of a point, but revenues rose by 6.6 per cent to over $10bn. That is with the pricing pressure that hyperscale data centers are bringing to bear as they use ODMs to build the boxes they are designing, or buying cheap, volume, dense boxes from the likes of Dell or HP. For all of 2012, some 9.51 million x86 servers shipped, up 2 points over 2011's levels, and revenues rose by 5.5 per cent to $37.5bn. HP is the top shipper of X86 machines, as it has been since buying Compaq, but it has been shrinking while Dell has been growing. That said, HP is the clear x86 server leader in 2012, with 2.64 million boxes out the door and $12.2bn in revenues, compared to Dell's 2.14 million machines and $8bn in revenues. The company to watch, of course, is networking giant and server upstart Cisco Systems, which sold 63,342 machines and generated $480m doing so, making it the sixth largest server maker in the world after only being in the racket since March 2009 and really only shipping since later that year. Cisco grew revenues by 49.5 per cent, much less than the triple digits it did two years ago, but there's no question the company is taking market share from all the other players. For the full year, Cisco sold 208,867 machines and raked in $1.61bn. That makes Cisco the number-five shipper in the world, behind Fujitsu and knocking out Oracle as the number six revenue maker, again just behind Fujitsu. * Bootnote: Appliance-as-a-business data center? That is one ugly term. So is big-data-driven social crack dealer, destroyer of bricks and mortar, and wrecker of the status quo. You know who you all are.